If you’re a football fan, visiting the world-famous Emirates Stadium, home to the Gunners, is an absolute must. Located in the heart of North London, this modern stadium is one that will blow you away. As the winners of 13 League titles, 13 FA Cups and 2 league cups, there is much to discover and explore at one of the world’s most successful football clubs. 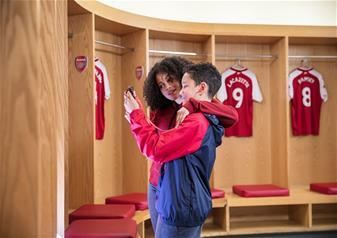 Have the special opportunity to go behind-the-scenes at the Emirates and experience it as the players would. Envision the likes of Aaron Ramsey, Mesut Ozil and the rest of the first team getting ready for a thrilling match against Barcelona as you explore the stadium. Feel the pressure that Arsene Wenger would have felt over his tenure in the Press Room, discover the horse-shoed shape home dressing rooms and the away dressing rooms before following in the footsteps of your favourite players down the players’ tunnel. It’s here that you’ll be met with the incredible sights of the Emirates pitch, known across the world for being one of the best kept football pitches. Get to go pitch side and soak in the sensational views of the stadium before taking your seat in the dugout where the manager sits when watching the games. Enjoy audio commentary throughout your Arsenal FC tour, giving you a fascinating insight into the rich history of Arsenal football club. Discover the secrets, facts and amusing stories that live in the walls of the Emirates as you explore. To finish your experience, you’ll get to immerse yourself in the Arsenal Museum where you can see the Club’s trophy cabinet and some of their most stand-out footballing moments. If you want a souvenir to remember your trip to the Emirates, have a look around the official Arsenal shop next to the stadium where you can find many branded merchandise and signed memorabilia. Steeped in history and famous across the globe for their successes in the English Premier League and in Europe, Arsenal’s Emirates Stadium is a must-visit. Self-guided tours are not operating from the 10th to 12th May 2019. Home fixture dates, the day before home matchdays against overseas opposition and any other events days taking place at Emirates Stadium. Exact dates to be provided once fixtures and TV Schedules are confirmed throughout the season.